Silk Amino Acids is also called the "Silk Essence", which the main composition are the free amino acids and less amount of di-peptide and tri-peptide with the average molecular weight of 90. (1)The composition of silk essence is very easy to be permeated to the derma layer of skin and to be absorbed by skin, so as to meet the effectiveness of skin-nurturing. (2)The silk essence have the better nourishing function for the hair injured either by mechanism or chemicals, which can permeate to the interior of injured hair (flaky structure) to repair or protect it. (3)The silk essence have a good dissolvability with anionic, cationic, nonionic or amphoteric surfactants or multi-kinds of oily materials, as well as a good compatibility in the formula of cream or shampoo etc. (4)Among the multi-kinds amino acid contained in silk essence, the content of glycine is the highest. Not only can it be used as the essential materials of synthesizing protein in the internal of organism, but also as the precuror of synthesizing the glutathione (GSH, GSSG), purine and heme, which the GSM plays a certain preventive function for angiocardiopathy, carcinosis & human senility. Meanwhile, the glycine also has the function of detoxication for some aromatics which can cause cancer to human body. The rich alanine in the silk essence has the functions of promoting the metabolism of alcohol in human body to protect the liver, and of reducing the blood sugar, therefore, it also is accepted for the products of dispelling the effects of alcohol. 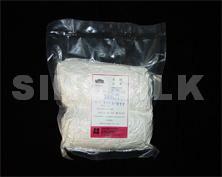 This property of silk essence have the wide application field in the development of healthy foodstuff. *The pathogen mainly refers to the enteric pathogenic bacteria and the pathogenic cocci. Package: This product is packed in the aluminum-plastic compound bag in vacuum condition 500gr, which the shelf life is two years under the sealing condition. Our company is the pioneer of developing the silk essence successfully in China and has got the import permission from the Japanese Medical and Health Ministry to export the silk amino acids to Japan, which is widely applied in biscuit, candy, bean products, noodles, ice cream, beverage and other nourishing foodstuffs. ©Unauthorized duplication of any data is prohibited. Copyright © 2003-2015 sinosilk All rights reserved.